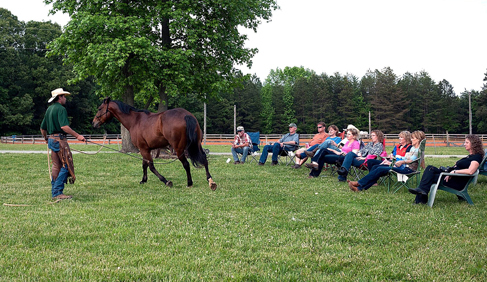 Located in rural Southern Virginia, Shangrila Guest Ranch provides guests with a variety of quality horses suited for any riding ability for Virginia Riding Vacations. 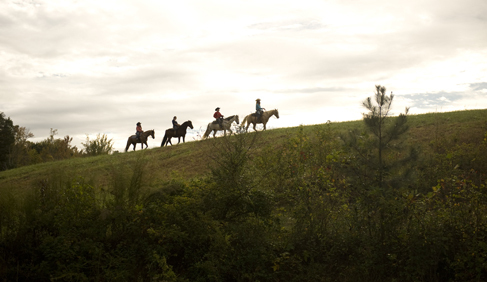 Guests may be as involved as they please with the entire guest ranch experience, including gathering horses in the morning, grooming and tacking. Through an expansive trail network, the hundreds of miles of trails in the area allow guests to experience a new adventure everyday. 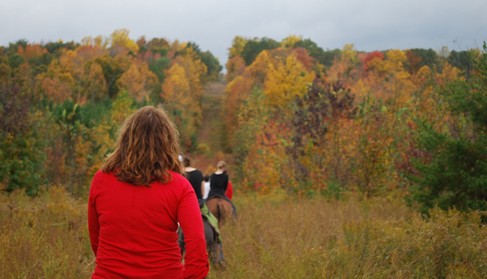 One section of the ride may be spent listening to the rustle of pine needles as your horse winds through tight turns, then you cross a creek, and suddenly you find the pines are replaced by maples, hickories, sumac and holly bushes; while thick ropes of vine drape across the trees. Your setting, once reminiscent of Narnia, now resembles a jungle. 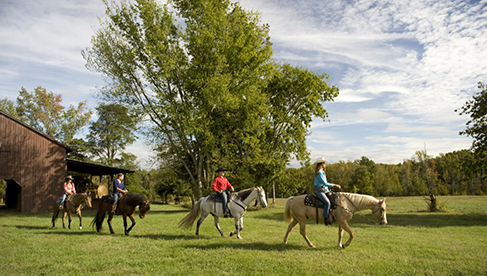 In addition to horseback riding and other on-site activities, Halifax, VA offers numerous recreational activities as well. Only in this area can guests experience unmatched southern hospitality where all the residents are glad to welcome visitors with open arms and share their stories about why they hold this place they call home so dear. 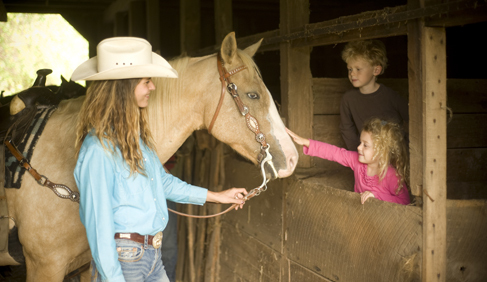 At Shangrila Guest Ranch, guests enjoy home cooked meals, personal attention, nightly campfires, and are always greeted with warm welcomes that exemplifies the guest ranch experience; come as a guest and leave as family. Guests may bring their own horse for a trail riding vacation or one of Shangrila's clinics or ride one of Shangrila's horses. 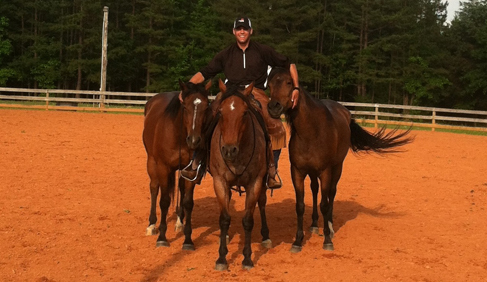 For those who want a smooth ride, Shangrila does have Gaited horses. 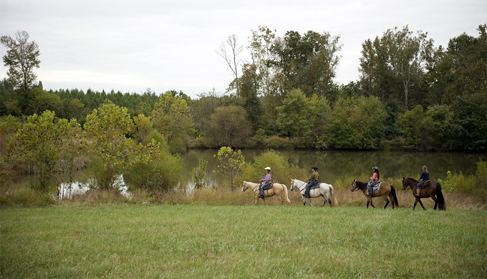 Visit the Shangrila Guest Ranch website for additional information and special Virginia horseback riding holidays and vacation packages. 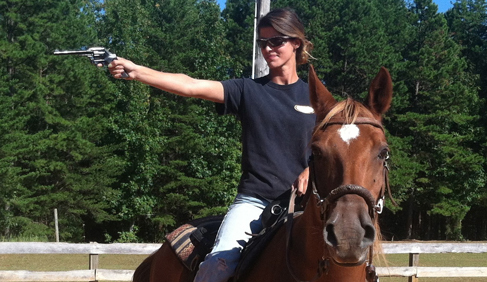 Ladies only, come join us at Shangrila Guest Ranch for a 5 night / 4 day cowgirl get-a-way! 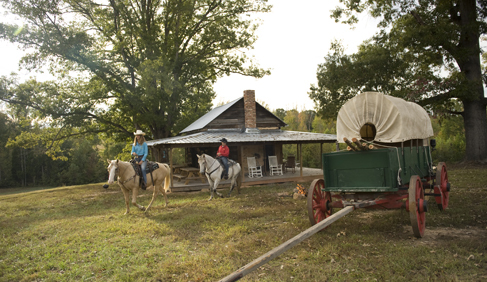 Enjoy horseback riding, wine tasting, shooting, archery, wagon ride, fishing and relaxing massage included in your cowgirl getaway package. 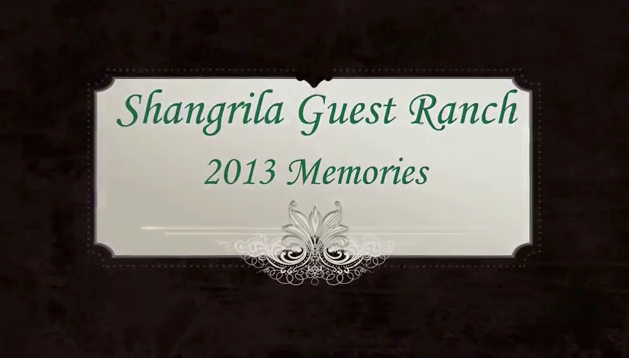 Learn more by visiting Shangrila Guest Ranch's website. 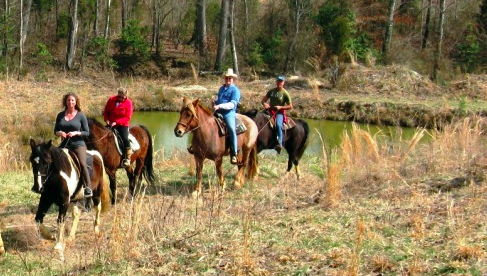 Emailing Shangrila Guest Ranch or calling 434-517-0888. 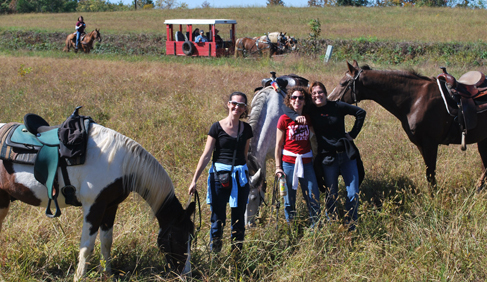 Lori and Nica invite you to join them for their 4 day/3 night outback adventure trip exploring the trails in southern Virginia! 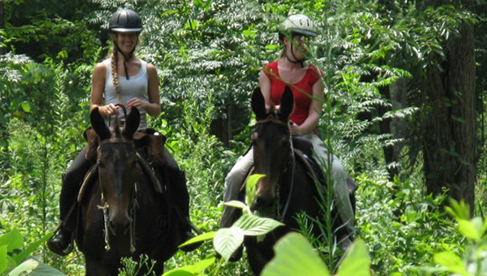 Enjoy a hands on primitive camping trip through the backcountry of Virginia, bonding with your horse with 4 days of riding. Relax in the evenings with a campfire under the stars! This is a very primitive, high adventure pack trip with hands on participation. 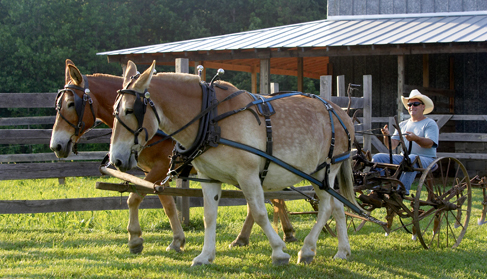 All participants are encouraged to get involved in every aspect of the trip, from tacking/untacking horses, gathering wood and preparing meals. Explore trails, from narrow paths through hardwoods and pines, to creeks and rolling hillsides. Sit out under the stars and get to know your wranglers and fellow campers while stargazing. A sure to be unforgettable experience! 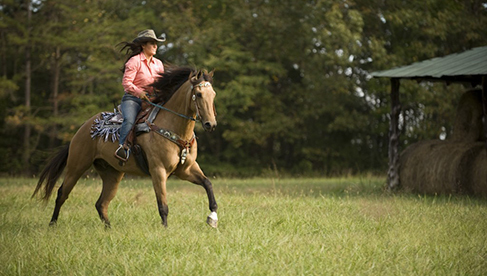 Western Horseback Riding with Riding Lessons and Clinics, Trail Riding, Natural Horsemanship Clinics, Cowboy Mounted Shooting, ACTHA Competitive Trail Rides, John Deere Gator Rides, Wagon Rides, Gaited Horses, BYOH- Bring Your Own Horse or ride on of Shangrila's. Wine Tastings, Hiking, Fishing, Bird Watching, Volleyball, Board Games, Ping Pong. Children, Corporate Retreats and Team Building welcome. 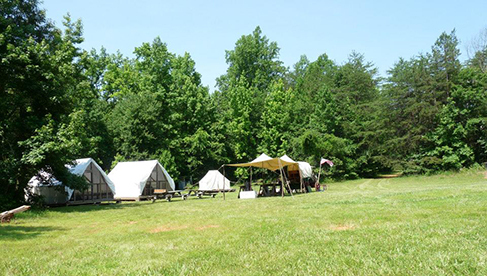 Learn more about Group Glamping. 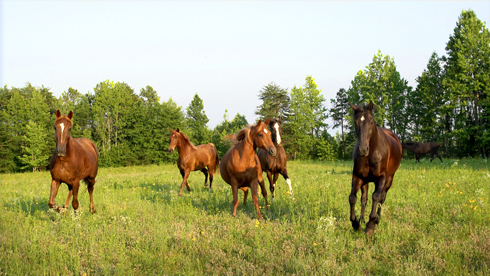 The unique lodgings at this Virginia guest ranch are private and have views of the horses and pastures. 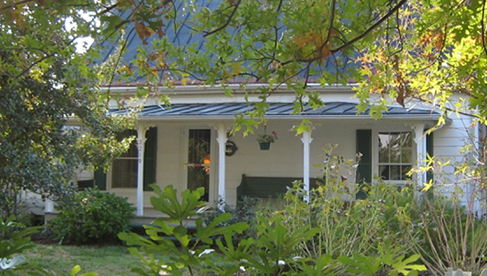 The Old Home Place was built in 1801. It has 3 bedrooms, one with a queen bed and fireplace, one with a full bed and fireplace, and one with two twin beds. It also has a kitchen, living room with fireplace, full bath, washer and dryer. The home provides a haven for visitors to relax, whether on the porch overlooking the herb garden or in the hammock for afternoon snoozes. Cozy up to the fireplace, relax and reminisce. The Log Cabin sits tucked in the woods and can accommodate up to 4 people. It has a full bed, full bath, open kitchen and living area with two twin beds in the loft. A small pasture lies in front of the cabin surrounded by trees. The secluded cabin is ideal for accommodating a couple and perfect for anniversaries, honeymoons birthdays or that special occasion. 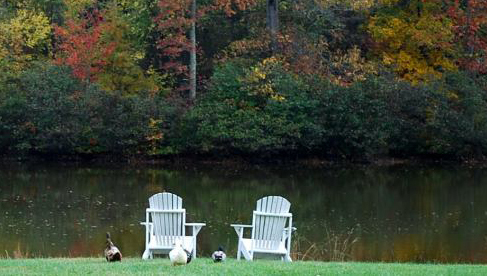 The Packhouse provides lodging for an individual, couple or small group. Formerly used as a packing barn for tobacco several many years ago, the large refurbished structure retains its rustic charm with the addition of modern conveniences. The backside of the upper floor is a private efficiency which will accommodate an individual or couple. It has a queen bed, private bath and small kitchen area. It also has a private deck that overlooks the pond and pastures. The middle room upstairs in the Packhouse has a queen bed, private bath, open living/kitchen area and futon. 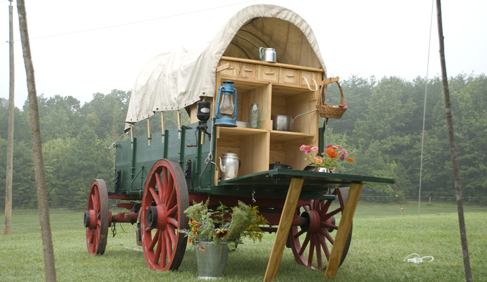 The backside of the lower level provides rustic accommodations with two twin beds. A separate bathroom with shower is located at the side of the building for guests use. Packages include all meals. Lunches may either be at the ranch or at a trail stop for trail riders. A variety of home cooked meals are provided and special dietary preferences may be made upon request. Virginia International Raceway, Staunton River State Park, Occoneechee State Park, The Prizery, South Boston Museum, Cages Sculpture Farm. Corporate Groups Meetings and Retreats Welcome. 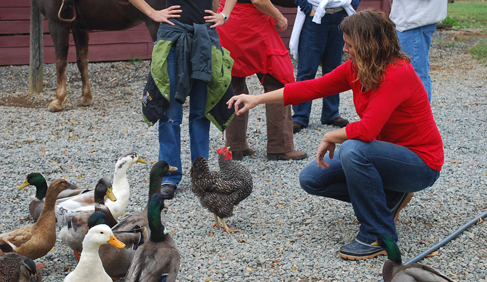 This guest ranch works with Travel Agents.